With this Joomla construction template, you are not limited to the prebuilt demo design and layouts. Instead, it provides you ample of personalization options to build any relevant website. The website template for construction companies offers a top-notch user experience to the site developers, admins, managers, and visitors. The Konstra template comes with SP Page Builder Pro inside (save $49) so you can create and edit web pages using its front-end drag-and-drop live editing system and versatile addons. The template is also multilingual ready. So, it’s undoubtedly the perfect solution if you are looking for a professional and easy to use construction website template- whether for your own business or a client’s one. Try Konstra today, and square off all your construction website needs! Wondering what it takes to build a complete construction business website? You're lucky today! 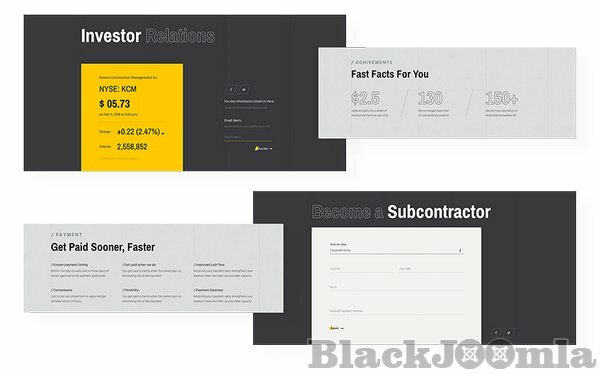 Get Konstra and start building outstanding construction service websites right away. It is a complete website package for construction and architecture companies, builders, real estate agencies, and relevant developers firms. From showcasing project portfolios to offering real-world services, Konstra covers everything required for a construction business. Let’s have a glimpse at the features of this Joomla construction template. Fulfilling your requirements, right? There’s even more you get inside Konstra. It’s time to dive deep. While building a construction company website, the most important thing you need to focus on is the design. Konstra serves this purpose perfectly thanks to its industrial design. A strong navigation system offers a solid browsing experience. Deliver this benefit to the visitors with the rich Hamburger mega menu given inside this Joomla construction template. 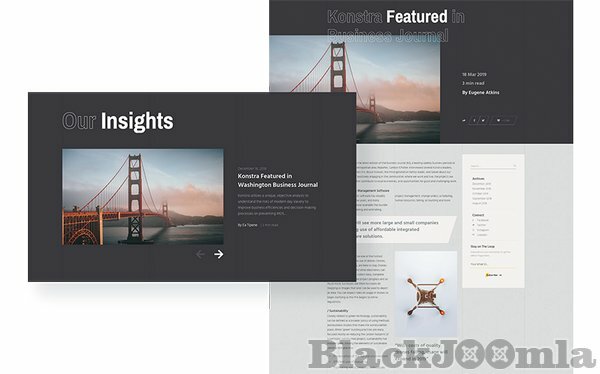 Konstra comes with a full-featured service page with a professional presentation layout that impresses the potential customer at the first glance. One of the most vital functionalities of a website is growing and maintaining user-trust. This Joomla construction template covers you here with its meticulously crafted portfolio and project pages. Portfolio: A well-planned portfolio page that presents the projects in a period-wise organized manner. Sliders at the top and the bottom add more beauty to it. Project Details: How to present a project so that it can convert visitors into customers? Konstra knows it. 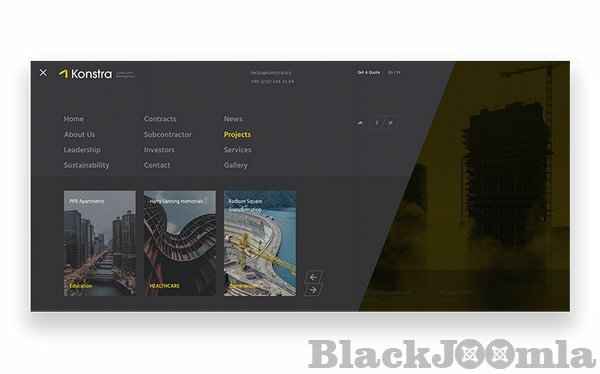 Display the projects on a Konstra powered construction site in an elegant way. 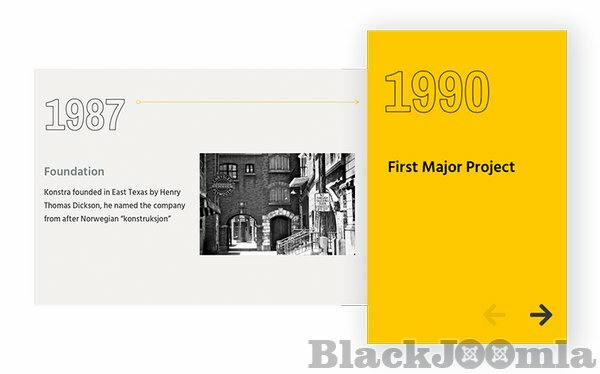 Tell every necessary project detail using the beautiful combination of texts and images. Construction businesses worldwide work with several types of contract mechanisms. 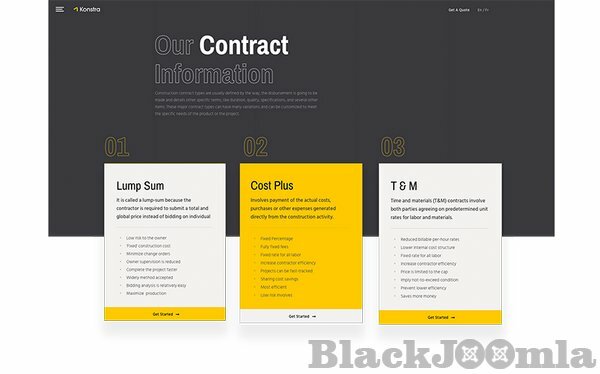 Whether your target company supports lump sum, cost plus or T&G method, this Joomla construction template presents them professionally. Konstra covers both the stockholders & stakeholders. 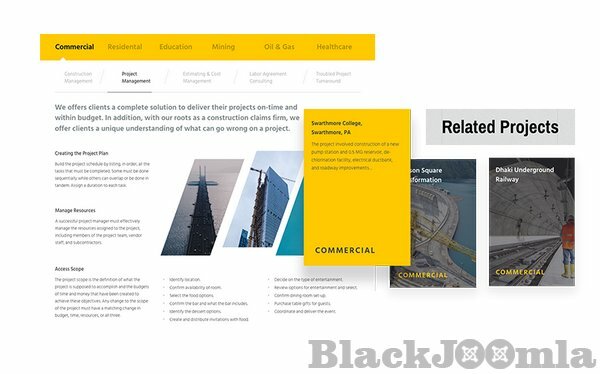 For the construction companies that use raised funds from investors and share market(s), an investor relations page is a must on their website. There is another readymade page for stakeholders, that’s for the subcontractors. Investor Relations: Show the world and the interested ones how your target construction business is performing in the stock market. Share the key stats, facts, and press releases. This page is designed to be a great source of valuable resources like these. Subcontractor: Konstra has a dedicated page for subcontractor affairs. Interested entities can contact the construction company to be a subcontractor using a specified form. Hero sliders can make a website stand out from the crowd at the first glance- given that, it has to be the good one. Konstra, the building contractor website template has the perfect one. The days of typical sliders are no more. Now you got to show the world how extraordinary you can be with your design. The Timeline Slider is specifically designed to show the milestones you hit along the way in a very sleek manner. A contact form is one of the core features of a website and it’s essential for getting messages from the potential clients. 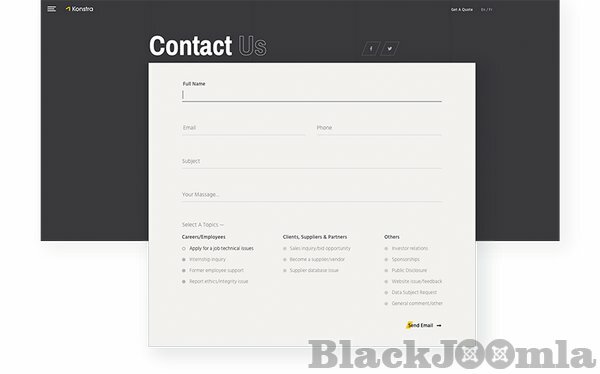 The robust contact form in this Joomla construction template not just comes with a nice design, it also protects you from spammers. We’ve used SP Page Builder’s Form Builder addon to create this form. Blogging is a great way to keep the interested ones informed. Konstra, the Joomla construction template makes it super convenient with a modern blog system packed inside. This Joomla construction template is built using SP Page Builder Pro that offers a cutting-edge drag & drop site development system. Konstra is built on top of Helix Ultimate, the world’s best Joomla template framework. SP Page Builder Pro: Build & customize everything visually on the frontend with the super functional frontend live editor of SP Page Builder Pro. Helix Ultimate Framework: With Helix Ultimate, develop an unlimited number of layouts. Build, style, and customize your own sections and make 100% responsive and mobile friendly layouts with it.